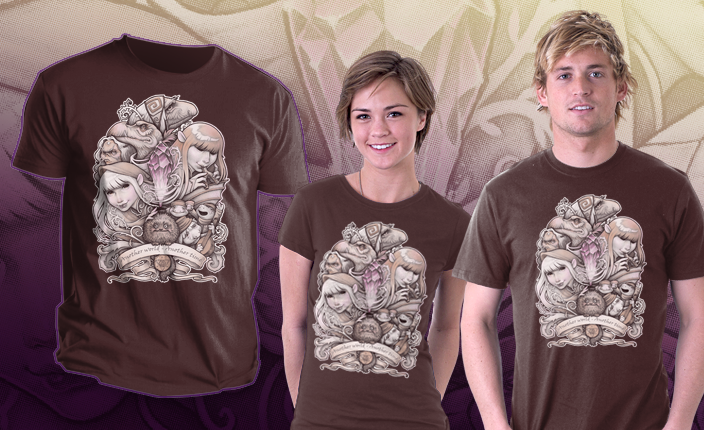 Affiliate post: The Dark Crystal Shirt! 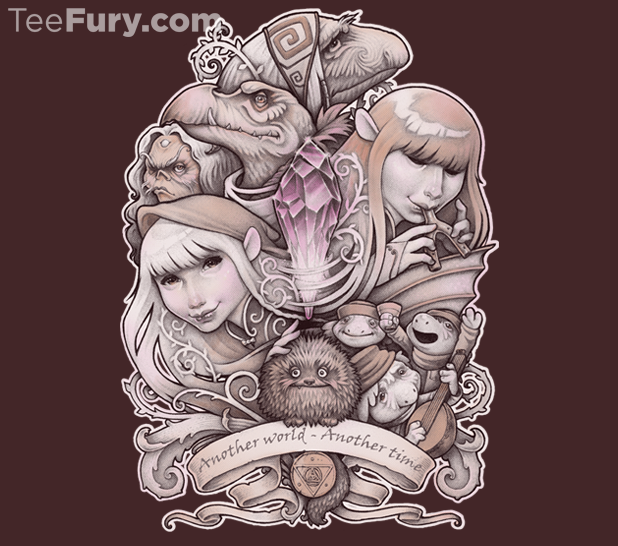 At TeeFury August 1 only! In Another World by MedusaD. Only $11 dollars. Guardians of the Galaxy opens Friday so here’s Groot and Applejack. See she’s a farmer he’s a plant. There’s a joke there somewhere. July 31, 2014 | Categories: Photography, Super Hereos | Tags: action figure, groot, guardians of the Galaxy, humor, marvel universe, my little pony | Comments Off on Still not Drax Day. 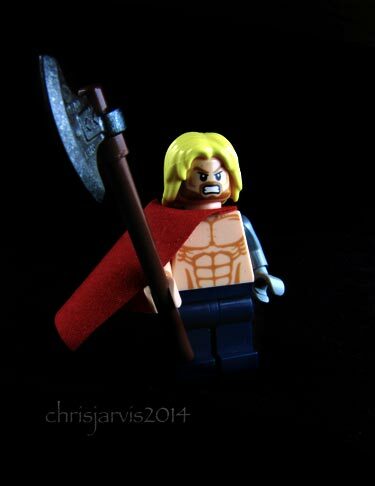 Thor’s Day and new custom fig. Thorsday is upon us again. 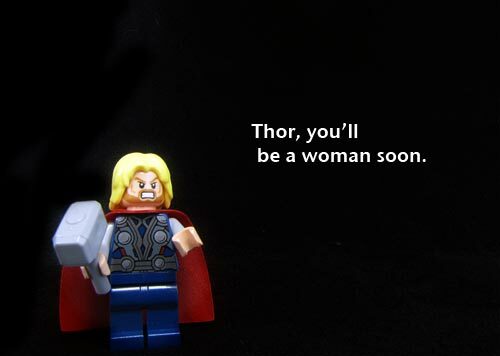 It’s been announced that Mjolnir will be welded by a female this fall. As the current character has become unworthy of Mjolnir. But he will still be around. 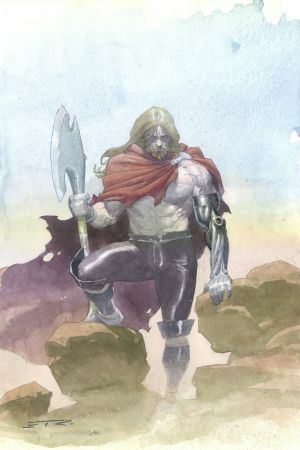 Here is my version of the unworthy Thor that we will see this fall. I made the figure with parts from my collection. I should have use black pants but they blend into too much with the black backdrop. What do I think about a female Thor. I don’t see a problem with it. Thor’s been a frog. Mjolnir has been used by Beta Ray bill, Storm, and Thunderstrike. Hopefully we will see some great stories. Others that have wielded Mjolnir. July 31, 2014 | Categories: Action Figures, LEGO, Photography, Super Hereos | Tags: comic books, comics, holidays, LEGO, Marvel, Mjölnir, Thor, thorsday | Comments Off on Thor’s Day and new custom fig. Is it Drax Day yet? 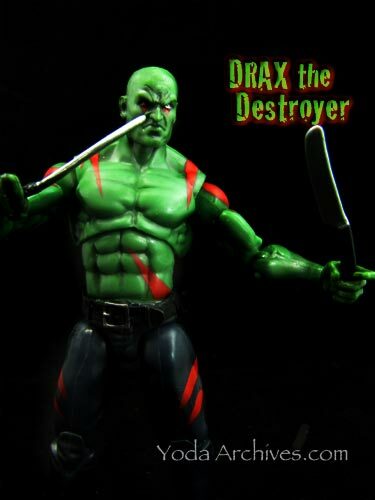 Guardians of the Galaxy opens Friday so here’s Drax. Time permitting, I’ll have another Guardians of the Galaxy post tomorrow. I been busy rebuilding the store. Plus we’ve had a break in the summer heat and I could do yard work and not melt. The new store is up so now I can process pics. 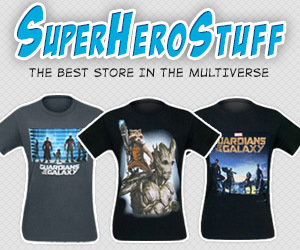 July 30, 2014 | Categories: Photography, Super Hereos | Tags: action figure, drax, guardians of the Galaxy, humor, marvel universe | Comments Off on Is it Drax Day yet? I am working on building a new print store. It should be up shortly. I’m going to begin with just a few prints. Some of my most popular or requested images. I’ll add more later I just don’t want to spend a ton of time uploading and rewriting everything from the old store. So I ask for your help in deciding what to list first. What are your favorite pieces? old or new? 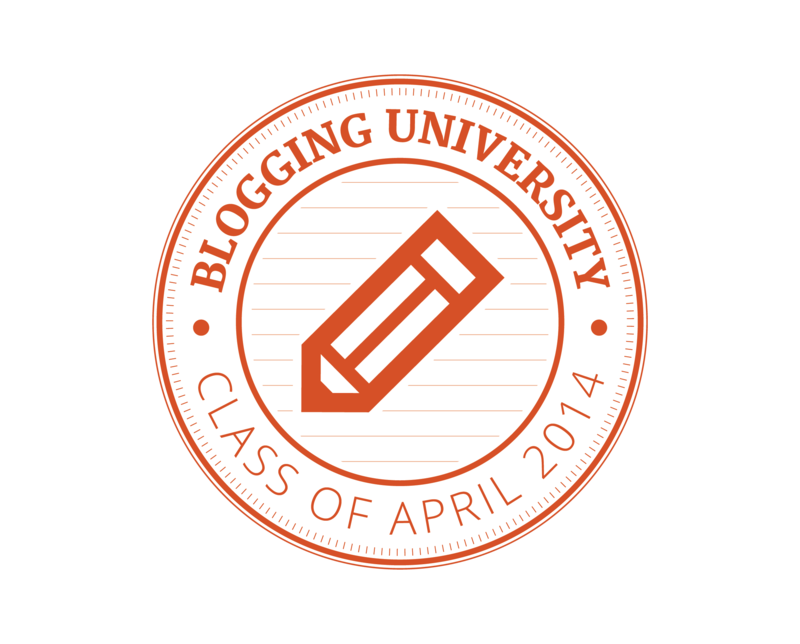 July 28, 2014 | Categories: LEGO | Comments Off on New store coming soon. “Who?” “Star Lord, man….legendary outlaw? 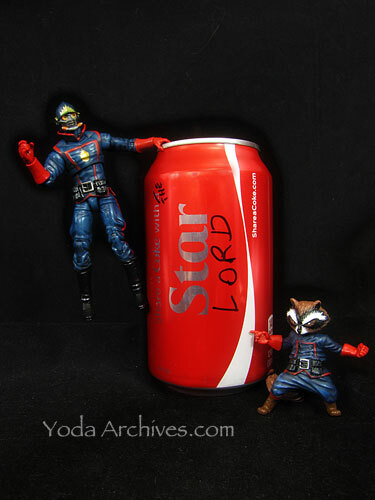 Guardians of the Galaxy opens this week, Starlord had to make his own personalized coke. Guess he’s not as legendary a outlaw as he thought. July 28, 2014 | Categories: Photography, Super Hereos | Tags: guardians of the Galaxy, humor, rocket raccoon, shareacoke | Comments Off on “Who?” “Star Lord, man….legendary outlaw? Target has started their end of season toy clearance. They have marked down several toys, including many building blocks sets. I spotted reduced Ionix Bricks , nanoblocks, KRE-O, mega bloks, and those light brick sets. I did not see any LEGO clearance. My local Target had KRE-O Micro changers series 3 down to $1.48. 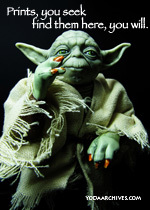 Very good deal on some figures especially if you want to army build or customize your figures. They also had the Micro Changers Combiners four figure sets for $5.48 half off the original price of $10.99. I’ve seen these reduced at a couple of Targets. Also reduced were some Nanoblocks sets. They sets were marked down 30% to 50%. They had many bagged sets and one store had a couple boxed sets. I built a set that I still need to review. I found Toothless Viking Attack (#21001) for half price. The set had the same Toothless that I already own so I passed on this. 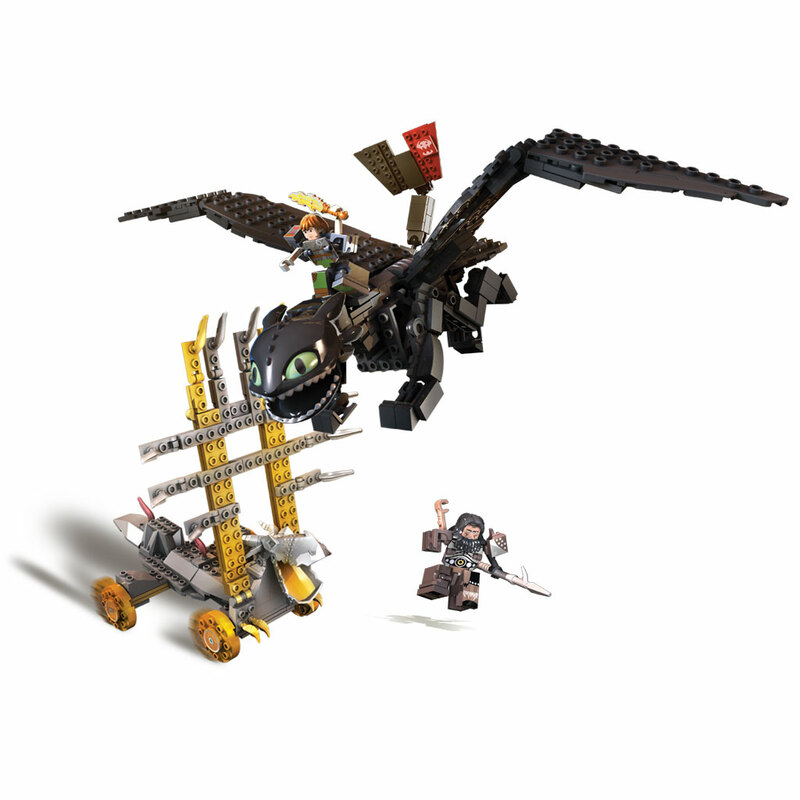 I did get the giant Toothless Battle set (#21003) for half price. Retail was $39.99 I thought that was too much for only 242 pieces. But 19.98 was a reasonable price. that puts the blocks about eight cents each. They did not have anymore of the small Dragon only sets. Target has reduced some of the Tenkai Knights sets. The blind bags figures were $1.94. and a few other sets were markets down. Will you head to Target to get some bricks? Have you see any other store marking down their toys? What deals have you found? I was going to run a “Not at the Convention” sale this weekend but the store is down. It’ll take awhile to fix so instead I’m juat poating more stuff in our E-bay shop. I’ll add some more items later. Awkward LEGO meeting at Shirt Woot. Today at Shirt woot. $10. 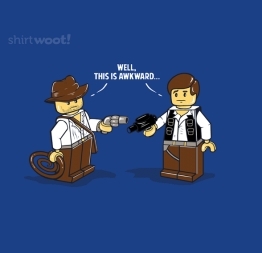 July 25, 2014 | Categories: Star Wars | Tags: Han Solo, indiana Jones, LEGO | Comments Off on Awkward LEGO meeting at Shirt Woot.